A place to call your own. A place to escape to for relaxation, fresh air, solitude, or adventure. Owning your own cabin can provide any and all of those, and if you start with a portable building you could have it within a matter of weeks, or even days, and start the process of making it your own… all for very little investment. Regular visitors to Homestead.org have already read how my wife and I decided that going the route of a portable building for a cabin was the right choice for us. Our jobs keep us hopping much of the year, and neither of us has an affinity for carpentry. I can use the tools and do what’s needed, but really don’t enjoy working with lumber. She’d rather avoid power tools altogether. But we had some land and wanted a cabin to get away to on the occasional weekend. I enjoy hunting, cutting firewood, cutting or clearing trails, mowing fields, maintaining roads, and generally improving the land. She enjoys sitting in her hammock chair and reading, peacefully working on her next quilt, or taking midday naps. And while she avoids most of the heavy work, she’s discovered over the years that she really enjoys driving a tractor and brush cutting fields. And she’s very good at it. Much of what I do on the property carries a risk of injury. In the past, we both were a little uneasy about me going to the remote property alone and doing tasks with a chainsaw, tractor, or other pieces of equipment that could put me in harm’s way with not even a neighbor within earshot to assist if needed. Having a cabin on the land would not only give us a place to overnight there, but it would give her a comfortable place to relax and be comfortable. Plus, if I need immediate help for any reason all I have to do is give her a quick call (since we do have cell service across most of the acreage) or yell. Thankfully it hasn’t come to that yet, but the peace of mind it offers goes a long way. Also, prior to the cabin, most working trips to the land were just day trips. She refused to spend the night in the dilapidated farmhouse that me and my hunting buddies used for deer camp each November. By adding some decent accommodations we could now make the trip and stay up to several days at a time… as work and other obligations allow, of course. That’s something I addressed in one of the earlier entries in this cabin series, how moving from spending hours on your land to wanting to spend days (and nights) is just a natural progression. And most people are willing to go without all the creature comforts for short periods of time. In fact, many people I’ve talked to or known over the years embrace the getting back to basics which comes with a remote cabin. In earlier parts of this series, I told how we sat down and made a list of the comforts we would require. We wanted to be off the grid but have some minimal electric power available, hence a small solar system feeding a couple batteries and an inverter. My wife really wanted an indoor toilet. We still plan on building an outhouse for nostalgia, but a simple composting toilet which utilizes sawdust has proven to be an amazingly simple and effective answer, especially on cold nights. We would need a way to prepare meals year round so a barbecue grill or fire pit wasn’t going to do it, although we have and enjoy both at times. By far the easiest answer was some kind of propane burners. While a portable camping stove would do the job, we went a slightly different route. You can’t live without water. Whether cooking, cleaning, or just staying hydrated, it requires a fair amount of clean water. The options are nearly endless. And we’d need a heat source for the winter. I’m traditional enough to believe a cabin needs a woodstove, especially when you’re surrounded by 80 acres of potential firewood. After those five concerns—lighting, waste, water, cooking, and heating—the remainder is just cosmetic. That includes insulation, wall coverings, floor covering, porch or deck, decorations, and the area around the cabin. Those final details will be covered in part four in a few weeks. Admittedly, you do not have to have all five of the basics in place before you start using your new portable building cabin. A week after our building was delivered we spent the first night in it. The only creature comfort we had in place was the composting toilet I had built while waiting on the building to be built and delivered. We slept on a mattress on the floor, used flashlights and a Coleman lantern for lighting. A portable water jug provided cleaning and drinking water. And since it was only late September we didn’t require heat. That first night was enjoyable and memorable. Our grown daughter was home for a visit and made the trip with us. She slept on a thin mattress in the loft. We made popcorn over a propane burner and sat up playing cards by lamplight. The first breakfast at the cabin was cooked on a propane camp stove on a folding table out in front of the building under a huge oak tree. Bacon and eggs and toast never tasted so good. But eventually, the time comes when you want some comforts. Here’s how we’ve handled them. As I said, we started with camping lanterns, candles, and flashlights. Now, a year later, we have hard wiring throughout the building and attached to a 100-watt solar setup. The cost of the system was minimal and it’s simple and works great. It provides both 12-volt power and, with a separate inverter, standard 110 household current. Let me preface this portion by saying I am not a licensed electrician, so nothing I explain here should be taken as gospel. I’m simply telling you how I’ve set up the system and how it works for us. There’s no reason to be leery of buying and using a solar setup for your off-grid cabin. An endless list of companies sell “plug and play” type systems which anyone can install. And the cost is minimal. Our basic system came from Harbor Freight and cost less than $200. In addition to that, I started with a new 12-volt marine battery (about $50) and a 400-watt inverter (about $40). Later I added a second battery (for free, given to my son by a coworker) and wired the cabin for both 12-volt and 110 current. To get the system started simply follow the instructions which come in the box. Unpack the panels, plug them into the supplied controller, familiarize yourself with the adjustments on the controller, then connect the output to your batteries. That gives you a bank of 12-volt power. Our system came with outputs to charge cell phones and two 12-volt lights with built-in switches. But I wanted something a little more permanent. So I built a wooden rack to hold the panels slightly off the ground. The rack was made and hinged to allow me to adjust the angle to make the most of the available sunlight. Surprisingly I’ve discovered no adjustment has been necessary between the winter and summer seasons. Each panel has a small blue light which shows when it’s receiving and processing solar rays. The controller gives a digital readout of how much the panels are working. I have mine set to shut off when both of my batteries (which are connected in series) reach 14.4 volts. After a sunny day, the system will be peaked out at the preset volts. Even after several cloudy days, it’ll still show around 13.8 volts. While I’m all about roughing it and living like my ancestors, my wife doesn’t necessarily share my enthusiasm for basic living. She wants bright lights available at night, a fan to stir the air on a warm day, and a means to run her sewing machine if she wants to tinker on a quilt project. So by adding an inverter—available at any camping or hardware or big box convenient store—you now have 110 household current available. Of course, using the 110 power will drain your batteries much faster than using 12 volts, but we’ve still never drained our batteries down to a point of concern. Even after a night of running several lights all evening, a box fan all night long, or maybe a sewing machine for hours, our two batteries have never fallen below 11.8 volts. That also includes charging two cellphones, sometimes charging a laptop (to download and look at pictures from game cameras) or running a corded electric drill or charging a cordless drill battery pack. I placed my batteries, controller, and inverter beneath the kitchen counter near the corner of the cabin where the wires feed in from the solar panels. It’s important that batteries be vented to eliminate any gases generated from the charging process. Our battery area is ventilated where the wires and a propane line come through the floor. Wiring for both 12-volt and 110 house current. To make the cabin user-friendly, I’ve gone the extra step of running wires for lights and plugs throughout the structure. My plan was to run lights off the direct 12-volt system so the inverter wouldn’t be required all the time. Then if we need to charge a phone or computer, run a sewing machine or power tool we can turn on the inverter and have 110 power available. To accomplish this, I ran wirings for both the 100 household current and 12-volt to each plug. I installed double plug boxes at each location. For the 12 volt system I used a white plug, and for the 100 system, I used a black plug. Now if we want to plug in a power tool, phone charger, or other such things we use the black plug receptacle. We can plug a floor or table lamp equipped with a 12-volt bulb (available anywhere camper supplies are sold) into a white plug and run it all day without even turning on the inverter. And these bulbs are every bit as bright as a standard 60-watt household light bulb. Overhead lights and a porch light are hardwired to switches and operate on 12 volts. After much research, I used 14 gauge wire for the 12-volt system and 12-2 w/ ground for the household current. The 12-volt wiring grid is connected directly to the batteries through a fused link, while the 110 grid is divided in half and both sides are connected to the two plugs on the inverter. To date, the system has never left us in the dark and works flawlessly! All total we have less than $450 invested. As I said before, the first improvement to be built for the cabin was a composting toilet. While you can buy a commercial composting unit which uses chemicals or heat to keep down odors and break down waste, there’s a much less simple and inexpensive way to handle waste. Following a lot of searching on the Internet and watching YouTube videos, I hit on a simple plan which uses a wooden box containing a 5-gallon bucket and topped with a toilet ring and lid. The lid of the box is hinged and has a hole cut in it which matches the top edge of the bucket. The only other component needed is a supply of sawdust. We also use a plastic trash bag as a liner for the bucket to make it even easier to deal with when we’re headed out after our stay at the cabin. The little toilet took only about two hours and $7 for a new toilet seat and lid. I already had the scrap plywood from previous projects, and since I homestead I always have 5-gallon buckets on hand. I created enough sawdust building the toilet to use it the first several times. A cabinet shop down the road from my house, and cutting my own firewood, supplies me with more than enough sawdust to keep us going (pun intended). How does it work, you ask? Amazing well, my wife would tell you. 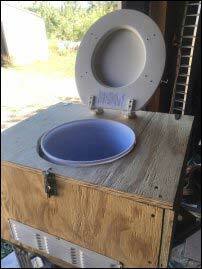 She’s become a believer in the simplicity and benefits of the “sawdust composting toilet”. How does it work? You start by putting a liner inside the bucket and dumping in enough fresh sawdust to cover the bottom of the bucket a couple inches deep. Then put the lid down and drop the ring into place. When the time comes to use it you simply do your business, and then sprinkle in a thick dusting of sawdust to cover your business. We use a small scoop and keep a supply of sawdust in a small trash can beside the toilet box. Additional sawdust is kept in a small metal trash can outside the cabin in a dry place. You can even put your toilet paper in the toilet. But it works best to do your duty, sprinkle in a coating of sawdust, then drop in the used paper and cover with a second coating of sawdust. Do it that way and I assure you a visitor would never know there was a non-flushing toilet hiding somewhere in the small cabin. Everyone who has ever visited our cabin is amazed at how effective the system works. I had mentioned earlier that we intend to build an outhouse in the future. It’s not that we’ll abandon the composting toilet idea, but just to have a traditional looking and working outhouse for nostalgia. In fact, I will outfit the outhouse with a composting toilet as well instead of the traditional hole in the ground. It’ll look traditional, but at the end of a visit we can simply lift the bench and remove the bag of waste and replace it with a new liner ready to go on the next visit. If it isn’t broken don’t fix it. Having fresh water in the cabin is the easiest creature comfort of all. All you need is some kind of container to carry fresh water from home. But from that most basic start, you can go any of several ways to make having fresh water more “user-friendly”. 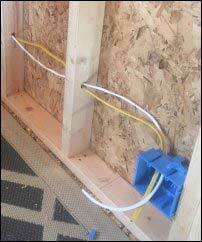 First of all, if you’re going to install water lines in a cabin the most cost-effective and simplest way these days is the use of Pex pipe. The flexible line comes in assorted sizes and is a breeze to connect to a variety of fittings. The next best option would be PVC pipe. Unless you’re a plumber or real handyman you likely not going to be sweating copper lines together, and fortunately, with PVC and Pex so easy to use and readily available there’s no need to use copper anyway. Gravity feed: On the simple end, we have a two-gallon plastic tank with a spigot valve which sits on the countertop over the edge of our sink. (Our sink is a small galvanized tub recessed into the countertop I built along one wall. The drain is a straight 1.5 PVC pipe which allows wastewater to drop into a 5-gallon bucket beneath the counter. Each time we leave the cabin we simply toss the grey water into the edge of the woods near the cabin. The next step up would be to install a water container high on a shelf and plumb a line down the wall into a faucet. Then you simply fill the container and set it back on the shelf and you have a few gallons of water at your disposal with the turn of a knob. The only thing to consider with any plumbed water system is that you need to include a drain valve at the lowest point in the system and remember to drain the line each time you leave the cabin in winter. Otherwise, the unheated cabin is going to quickly leave you with a frozen, and likely busted, water line to deal with on the next visit. Power feed: The route we’re headed in is to install a small 12-volt pump somewhere beneath the sink to feed water from a jug to a faucet at the sink. I purchased the pump months ago but simply haven’t taken the time to find a small set of faucets and the adapters needed to connect it to the line from the pump. When I built the kitchen counter I allowed enough space for a 5-gallon water jug to sit alongside the 5-gallon grey water bucket. The 12-volt pump will be wired to our battery bank with a simple switch to turn it on and off as needed. I could also go with a pressure-sensitive switch similar to one used in a camper which would turn the pump on and off as needed when the faucet is in use. That takes care of countertop water for handwashing, drinking, and dishes. But what about personal hygiene? At first, we just took sponge baths with a sponge or washcloth and tub of water warmed on a burner or the woodstove. 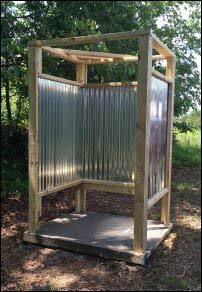 But after a few months, time allowed me to build an outdoor shower stall. I used 2X4 treated lumber, barn metal for the walls, and poured a concrete floor once the structure was built. I angled the floor by an inch over the four-foot width to allow the water to run off in one direction, away from the pathway. Next, I took a few pieces of 1-inch PVC pipe and a ball valve and made a nifty “rain” shower head. The pipe is attached to a five-gallon water jug. In the summer we fill two five-gallon jugs with water and let them sit out in the sun all day to heat for the evening showers. In the winter we heat a couple gallons of water on the woodstove or cooktop and then mix it in with three gallons of cooler water in the jug to give us the right temperature for a shower—about 100-108 degrees feels fine. If you don’t wish to bother with heating shower water, several retailers sell portable propane water heaters which connect to a 25-pound propane tank like the one you use for the patio barbecue grill. You simply connect the propane supply and water hose (which could be fed by gravity from a jug above the heating unit), ignite the unit and have hot water on demand. We’ve yet to take that step, but my wife seems in favor of purchasing one. Until then, our solar- or stove-heated water gravity-fed shower works just fine. The lumber and water jug and plastic pipe cost a total of about $150. If you prefer not to have grey water from a sink or shower end up on top of the ground, you can always dig in a grey water drain field. If you do so, consider exploring leaching chambers. They’re by far the most effective way to create a system which should last for decades. Other options include running the grey water into a buried barrel which has been perforated with holes, but those systems do eventually reach a saturation point where they’ll cease to drain. Using a couple leaching chambers (which can be bought or done using a plastic barrel cut in half lengthwise) with a gravel base you can assure adequate drainage for years to come. Do a quick online search for leaching chambers and related videos and you’ll see what I’m talking about. While each of these topics has a multitude of answers, when it comes to cooking with ease there’s only one clear leader: propane. At home, you might have options of gas or electric, and depending on where you live that gas could be natural gas or propane. But most tiny cabins are going to be far from a buried natural gas line. Small solar systems simply aren’t up to the task of running an electric range top or oven. Cooking on a wood cookstove is an option, but dedicated wood cookstoves are sizable and could quickly fill a small space. And most small wood heating stoves can hold a pot of beans or frying skillet on the top, but still doesn’t allow for baking. That makes the clear-cut option for off-grid cooking some kind of propane cooktop. 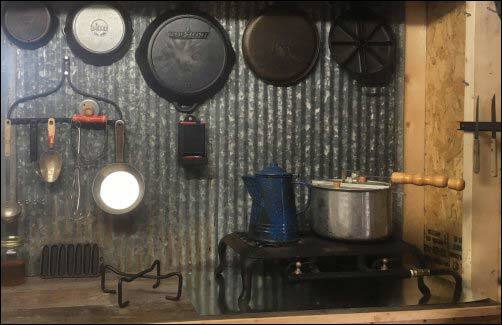 The cheapest readily-available means of “cooking with gas” is to use a propane camp stove, whether attached to a 25- or 40-pound tank or the small handheld canisters. Such stoves are available wherever camping supplies are sold, and most have at least two burners which work independently. That means you can have two pieces of cookware going at a time, which really opens up the possibilities for meals. It also allows for cooking food while also heating coffee or water for dishes or washing up later. Other possibilities range from using a free-standing fish or turkey fryer burner—which I’ve used on occasion—or finding a cast iron propane burner unit. The one I have, and that we used at our cabin, is an antique I bought for $25 at a flea market many years ago. It has no advantages over a portable camp stove except that it looks more vintage. With any propane burner in an enclosed building, whether for heating or lighting, always assure adequate ventilation and do not leave the fire burning while napping or gone. Most camp stoves and lanterns do not have any safeguards to shut off gas flow should the flame be extinguished by a gust of air or other unforeseen reason. If the fire goes out the stove will continue pumping unburned propane into the room. Even with the fire lit a properly burning stove will emit potentially harmful gases—hence the need for ventilation. Before we move on to another topic, let’s discuss two related items which will make cooking with gas in your cabin exponentially better. First, in our case, we have the propane burner permanently sitting on the kitchen counter. Of course, you don’t want the tank of fuel near the stove, or even inside the structure. So the feeder line for our stove runs from the stove down and through the floor to the regulator and tank outside. But initially, our property wasn’t occupied except for our occasional visits. I didn’t want a propane tank sitting outside for the taking by someone who was trespassing and looking for something to steal. So each time we arrived at the cabin one of the first things I would do is to connect the hose to the tank with the brass fitting. That meant keeping a sizable wrench on hand and always having to check for gas leaks before I could move on to the next task. The simple fix was to order a quick disconnect ($18) for the propane hose/tank. One piece attaches to the tank and the other to the inlet of the regulator, with a small valve which opens and keeps the system from being disconnected while under pressure. Now I simply snap the hose onto the tank connection, slide the valve open, crank open the valve on the tank and we’re ready to go. The first time you go to light a burner you’ll notice there’s air in the line at first, but it only takes a couple seconds to clear and let gas through. This is the case anytime you disconnect and connect a gas line. The last accessory you’ll want to buy is a box stove to use on a propane burner. The two I’ve owned over the years were both Coleman brand (retails around $38), but other companies make them as well. The sheet-metal stove comes folded flat and takes only a few seconds to snap into shape. When ready it’s about one foot wide, deep and tall with a moveable wire shelf inside. It has a hole in the bottom to allow the heat in, and a door on the front with a twist knob and a thermometer. You can quickly bring the little over up to 300-400 F, warm enough for most baking tasks. We often use the oven to make biscuits, rolls or cornbread for meals, or muffins or brownies for snacks during late night card games and sitting around the campfire. As far as I’m concerned it’s a “must have” accessory. As for heating, you can go modern or old school. Small portable buildings, especially once they’re insulated, require very little heat to keep them cozy comfortable. Keep that in mind when exploring heating options. You won’t want a system rated to heat a small home. You’re talking on average 250 to 600 feet of space to heat for a portable cabin. If you’re not interested in that rustic cabin look, the best option might be an efficient and relatively inexpensive ventless propane wall-mounted heater (retail for anywhere from $150-400). These little stoves take up very little space and put off an amazing amount of heat for the minimal propane they consume. Antique, family-heirloom woodstove in place in the new cabin. While we started with a portable building for our cabin, we wanted a vintage look and feel. That meant using a freestanding woodstove. We heat our home with wood part of the time during the winter, but do so using a wood furnace. While the heat is much “warmer” than that produced by our electric furnace, we still don’t have the luxury of sitting by the stove and feeling the heat radiate off the surface. We also don’t have the luxury at home of heating water, or chili or soup, on top of the woodstove. We’re nostalgic in that sense, so having a woodstove in the cabin was a must. Our first idea was a small boxwood stove like those made by Vogelzang or US Stove Company. I’ve had one of the stoves in the past and was pleased with how it worked, and the fact that the top was flat and has two removable burners for cooking or heating water. But for my entire youth and young adult years, until they passed, my grandparents heated their farmhouse with an old Longwood National Excelsior Stove and Manufacturing Co. stove made in Quincy, Ill. 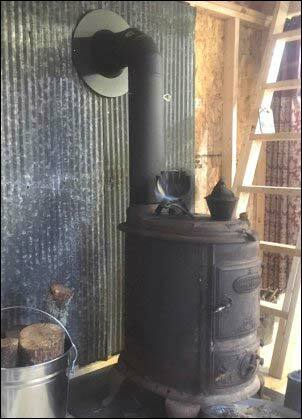 Some research in recent years showed that stove was produced in either the late 1800s or early 1900s. After decades of regular use, the stove still fires up and heats as efficiently as any freestanding woodstove I’ve ever seen. So it was a no-brainer in our case, we needed to have grandpa and grandma’s stove in the cabin. Whether you go with a vintage model or a new one, the installation is pretty much the same. Again, I’m no expert and you’d be best advised to turn to a professional, or at least research some professional sources, for proper installation. You’ll want to use a wall or ceiling thimble where the stove pipe goes through the wall or ceiling/roof. It’s also strongly suggested to use double- or triple-wall stainless pipe from the point where it goes through the wall or ceiling until it reaches the cap at the end. You could always build a block or lined brick flue, but it seems strange to go to such permanent measures on a portable building cabin. But to each their own, I say. This installment is already way too long, but I hope it holds some useful information for you. One final tip to consider. Another inexpensive option for outfitting a portable building cabin, or a site-built cabin for that matter, is to buy a used camper trailer and use the creature comforts from it and scrap the rest. From 12 volt lighting to propane stoves, refrigerators and furnaces, all of this can be found in a used camper trailer (which, in our area, can be found for $500-1,000). It requires being handy with basic tools and not afraid to take on a project, but if that’s you then it’s worth considering. In fact, the camper will even provide windows, doors, and furnishings. It’s not the way we went about outfitting our cabin, but I’ve seen it done by others and it worked. In the final installment in a few weeks, we’ll discuss finishing out the portable building cabin, and talk about wall and floor coverings, insulation options, décor, and more. But the beauty of a portable building cabin is it doesn’t have to be completed to enjoy it. From the time it’s delivered it can be a fun getaway from the daily grind.